Evolutionary networks are used in both biology and the social sciences. Furthermore, you will also occasionally find them elsewhere, as a means of displaying historical relationships among objects or concepts. Here are several successful examples of what I mean. In all cases the networks describe known relationships, rather than being inferred. This first one is a biological example, taken from the web page of Sparlösa Trädgård, a well-known Swedish garden. I interpret this as a hybridization network. It shows part of the history of rose cultivars (in the genus Rosa), with the arrows indicating the origin of most of the different types that one encounters in gardens today. The history is quite accurate, although no specific dates of origin are given; and a more detailed word description can be found at the web page of Kew Botanic Gardens. This second one is an example of manufactured design, taken from the book by Peter Connolly (1981) Greece and Rome at War (Macdonald Phoebus Ltd, pp 60-61). The Kegel-Illyrian group of helmets are on the left, and the Corinthian-Chalcidian-Attic group are on the right. 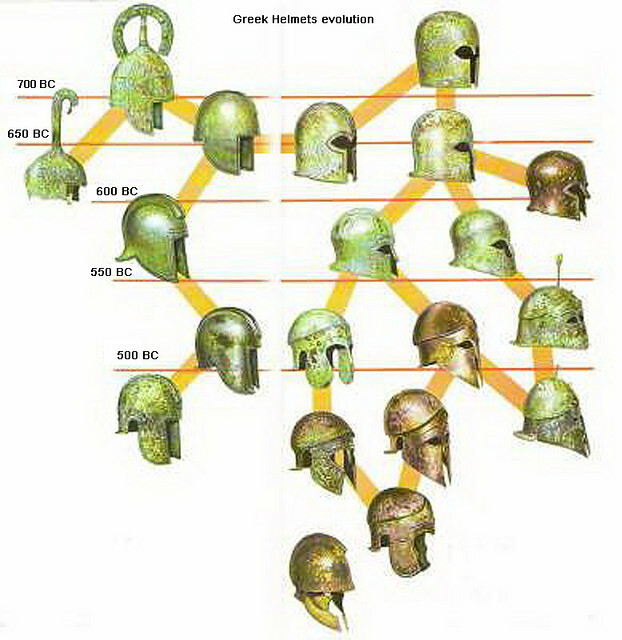 Near the top centre is a "cross-breed between the early Illyrian and Corinthian helmets, having more than one characteristic of each." The hybrid type at the bottom is the Attic type, while the one to the right is the Italo-Corinthian. The unconnected helmet is the Thracian type. Note also the parallel evolution of the cutaway for the ears. This third one is another example of manufactured design. 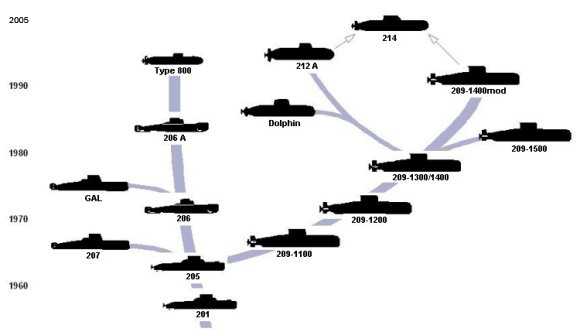 In this case the U214 submarine was developed "on the basis of the proven design principle of the Class 209 family with additional incorporation of innovative features of Class 212A" (quoted from the Howaldtswerke-Deutsche Werft GmbH website). The 214 thus incorporates successful design features from the 209-1400mod submarine, which is the most recent version of the Class 209 family of diesel-electric patrol submarines, and the 212A, which has a hybrid diesel-electric/Air Independent Propulsion system based on fuel cell technology. The fourth one is an example of ideas rather than objects, taken from the Futurist blog, although it is also available at Wikipedia. It allegedly shows the GNU/Linux Distribution Timeline, but it is actually drawn as a set of genealogies. Note that the networks are linearized to have a central axis, like a tree. The connections of the "side branches" to the "main axis" are somewhat meaningless — the time of origin of the distributions is represented by a dot, and the curved nature of the lines connecting those dots is nothing more than artistic fancy (they should all be vertical lines not s-shaped). These are networks because there is horizontal transfer (ideas added) and recombination (ideas replaced) among the distributions. http://www.levenez.com/lang/ Has a computer languages one as well, along with one for UNIX and one for Windows. I will be discussing some of the networks for computer languages in a later post — not all of them are good examples of networks. I've also seen at least one paper using network to reconstruct relationships of human languages (as I recall, it was something like finding distances using Swadesh lists and building split decomposition network), but it's in Russian. There are several such papers. It is actually an area of current controversy in linguistics and anthropology, whether they should be using trees or networks to depict historical relationships. Horizontal flow of information within human history appears to have been an important effect. Who published the first phylogenetic tree?